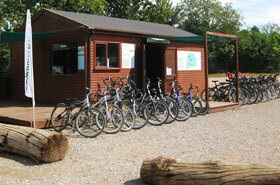 We are THE place for bicycle hire in Richmond Park and we have an excellent range of cycles for use on the trails paths and roads of the Park. Our selection of bikes is of a very high standard – bikes may be hired by the hour, up to a maximum of four hours (longer hires are by special arrangement). 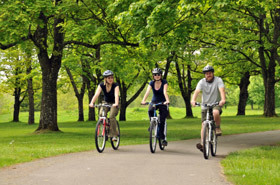 Our cycles include adult trail bikes (small to extra large) and children's bikes (two sizes) as well as children’s trailers and tag-alongs for very small children and baby seats (which attach to the adult bikes). In addition we have a small number of tandems for a unique shared experience! All the bikes are geared to enable all parts of the park and it's undulations to be reached with comfort. All bikes hired are supplied with a helmet for your safety – free of charge. We are open weekends year round and every weekday in high season. In mid-season we are open every weekday unless the weather is very poor. From November to March (low-season) we are open Wed - Sun (weekdays subject to weather (please see Newsflash or check the twitter feed for updates). We are open weekends year round and on weekdays 7 days a week from April until the end of September. From October to March we are open weekdays subject to weather (please call or visit the website and check the newsflash for updates on opening). Please check the calendar for details. We offer varying rates depending on the time of year so that we can offer our customers special reductions outside term times and at those times of year when the weather is less reliable. In addition we offer discounts for booking in advance; groups; schools and corporate customers – please see the "Opening Times & Prices" page for full details.